“DOL Smacks 401k Adviser for 12b-1 Fiduciary Breach. Plan Sponsors Next?” (FiduciaryNews.com, March 26, 2013). An old case suddenly takes on more relevance as the DOL may have Plan Sponsors in their cross-hairs. While pensions have proved to be the parlor trick they are, 401k plans have stacked up an impressive record of success – for those with the self-responsibility to take advantage of them. So why do so many insist on dumbing down the majority to make up for the more feeble minority? The same folks that brought you the “No Child Gets Ahead” – er “Left Behind” Act might offer an explanation. We’ll let the readers connect the dots. “Court to Decide on Pensions in Stockton, Calif., Bankruptcy,” (New York Times, March 25, 2013) While CALPERs trustees have been focused on changing the investment world, their constituent municipalities have begun to teeter on the verge of bankruptcy, posing a much greater threat to their beneficiaries. At what point was their fiduciary duty breached? “Altering of 401k Tax Incentives Alarms Retirement Industry,” (AdvisorOne, March 25, 2013) Now the fallout from last week’s talk of tampering with our successful retirement incentive system by no less than the esteemed U.S. Senate begins. Did you know that 90% of all Americans participate in a contributory retirement plan (even if they no longer contribute)? Participation is only the beginning. We need greater savings. Not only are friends in Washington devising ways to not induce greater savings, they are actually considering changes that could quell participation. And if you don’t know what the verb “quell” means, you accidentally Googled this site. Sometimes we get angry and the rampant dishonesty of supposedly smart peoples’ arguments. Case in point: The second article in this section. “Final Days for Advisors to Voice Fiduciary Attitudes and Practices,” (AdvisorOne, March 27, 2013) If you care anything at all about fiduciary issues, please take the time to complete the survey linked to this article. “Congressional Black Caucus raises concern about DOL fiduciary duty rule,” (InvestmentNews, March 27, 2013) So, apparently a group of congressmen feel improving the protection of retirement investors will hurt black investors. The last we looked, money has only one color – green. Some will say to suggest or imply the DOL’s proposed new Fiduciary Rule will hurt a single race is the definition of racism. Well, we won’t go that far, but we will opine these congressmen ought to reread the Magna Carta and the history of trust law before inflicting their uninformed opinion on those trying to seriously address the safety of retirement investors. You can almost hear the clock ticking. If it’s not the DOL, it’s the trial lawyers. And plan sponsors better have all their ducks in a row. “401k Litigation: The ‘Next Asbestos’?” (Retirement Income Journal, March 26, 2013) This is all about fees. It’s a great rundown of the current status of litigation – a fun read for those plan sponsors who don’t think they have anything to worry about. Class action attorneys are licking their chops. The question is will they merely focus on “high” fees (not necessarily a good thing) or on fiduciary conflicts-of-interest (a good thing). “Your 401k Is Out to Get You,” (The Atlantic, March 27, 2013) One would have expected more from a media property of this prestige, it does a surprisingly fair job of outlining the major problems with 401k plans. Unfortunately, it neglects to mention all the good news of the 401k, and it also doesn’t point out how easy it is to fix the problems it brings up. But it does gratuitously make note of the authors recently accepted law journal article. Now, that’s class. “12b-1 fees and the 401k plan sponsor,” (BenefitsPro, March 28, 2013) The DOL recently fined an adviser to engaging in self-dealing by selecting funds that paid them 12b-1 fees. This was based on actions that occurred prior to 2010. Today, the same situation will land the plan sponsor in hot water, too. The famous physicist Richard Feynman once said something to this effect: “Once you test a hypothesis, it either fails or it succeeds. If it fails, that’s it. It’s done. No matter who you are, you can’t put Humpty Dumpty together again.” It’s frustrating when people don’t take Feynman at his word. “Stable Value Funds: Trends – And What to Look For,” (Employee Benefit Adviser, March 21, 2013) A good article identifying some of the more important review factors for the typical 401k fund’s bread-and-butter, yet most mysterious, option. “Three-Quarters of Active Managers Underperform Indices,” (On Wall Street, March 26, 2013) Folks, this is yet another flawed study. It seems like we have a rash of this “studies” every time the markets approach highs (there’s a reason for that – that’s precisely when indices outperform active management). In this case, the study ignores the three worst year period for the market (2000-2002) and only looks at data after that point. It further compounds the error by looking only at asset-weighted returns, not average returns (we all know the bigger the fund gets, the more like the index it looks, making it more difficult to beat the index after fees) and, finally, it measures active mutual funds against theoretical indices, not actual index mutual funds, where the apparent 50 basis point advantage can easily be erased by fees (yes, there are some index funds that charge this much and more). But, hey, let’s not let the facts get in the way of a provocative headline. “Passive equity portfolios of the 10 largest pension funds,” (Pensions & Investments, March 26, 2013) Coming on the heels of CALPERs announcement it was considering going all passive, this is interesting, especially if you’re a political animal. See if you can find the similarities between the states that are heavily passive and those that are not. A more interesting question would be to find out how these pension plans actually performed. In keeping with the comments in the previous article, let’s pick an “arbitrary” time frame, say, the ten year period from 12/31/99 to 12/31/2009. Kudos for the first news agency to do it. “The only category where active management is winning,” (InvestmentNews, March 25, 2013) See, this whole “Snapshot-in-Time” way of looking at things can work both ways. In this case it’s instructive, as the particularly category here (during the study’s 3-year snapshot-in-time timeframe) displays a weak performing market, exactly the type of market cycle where, historically, actively managed portfolios have consistently beaten passive portfolios. “U.S. 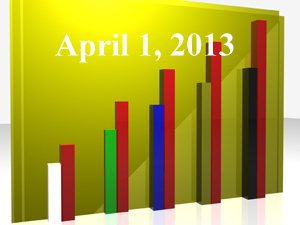 Stock Market: Too Good to Be True?” (WealthManagement.com, March 26, 2013) 2000? 2007? These are not years to throw around lightly, but the author believes 2013 will be added to that infamous list. Read at your own peril, but do read. “Is an Aging Bull Market Seeking a Correction?” (Businessweek, March 27, 2013) There’s an old adage that says “a bull climbs a wall of worry.” There are also fundamentals. Guess which wins in the end: Fundamentals or Old Adages? Target Date Funds: DOA or Just a False Start?